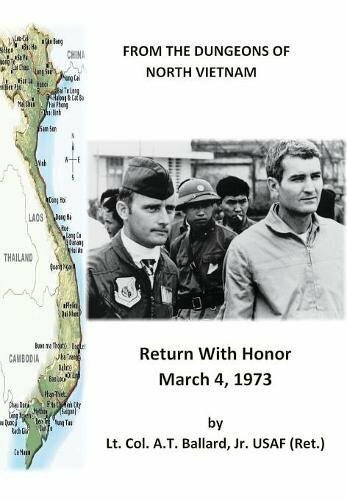 “From the Dungeons of North Vietnam” provides the reader with an up close and personal perspective of Lt. Col. A.T. Ballard’s time as a prisoner of war after being shot down on a military mission in 1966. Being a veteran pilot, Colonel Ballard knew the risks of the mission yet found himself ejecting from his jet after being hit by enemy fire. Ballard would begin his six and a half years of hell being tortured, starved, and humiliated along with his fellow soldiers who were also captured. All soldiers know the Code of Conduct and how to answer when interrogated by the enemy, yet how much torture and broken bones can one take without giving in? Colonel Ballard remained strong in his convictions to not give in or provide any pertinent information during his captivity. Ensign George McSwain from the Navy had been living in solitary confinement before Ballard’s capture; it was he who taught Ballard how to communicate with other prisoners and took care of him when he didn’t think he would live. As prisoners were transferred to new locations, each one would attempt to be seen and identified by others by showing their full face when going to the rare showers. Ballard does an excellent job describing his and other captives living conditions and treatment. I doubt any civilian can fully understand what these brave soldiers went through on a daily basis. I can honestly say that reading this memoir brought back so many feelings of those we lost, and those who returned home never to be the same again. Ballard puts readers right in the cells with him, and each person will feel what he feels at any given moment. Part Two of the author’s book is an in-depth reflection or recap of his story, which I felt didn’t need to be. I would have rather he addressed his homecoming, how the public and his family reacted and how he adjusted to being back. I would recommend “From the Dungeons of North Vietnam” by Lt. Col. A.T. Ballard, Jr. USAF (Ret.) to anyone who is interested in military historical information and for families who to this day are grappling with the loss of the person they once knew. I would be interested to see if any female soldiers have been captured and held prisoner since they now are allowed to fly military missions and be in combat.